Are you wondering whether this oral prosthetic is the best way to replace your missing teeth? We know that for adults, tooth loss can be a serious and upsetting situation. After all, you thought your smile would last you the rest of your life. There are so many reasons why adults lose permanent teeth but the most important thing is that you turn to our Lindenhurst, IL, dentist, Dr. Brian Gniadek, for treatment as soon as possible. We offer a variety of tooth replacement options, but if you are looking for a fast, simple and inexpensive option then dentures could just be exactly the restoration you need. There are two main types of dentures: partial and complete. If you have to have all of your teeth extracted or if all of your teeth have fallen out then complete dentures will be the best option. If you still have healthy natural teeth left then partial dentures will be a better choice. Full dentures are removable and use natural suction to stay in place while partial dentures are often fixed in place by using healthy natural teeth to support the false teeth. 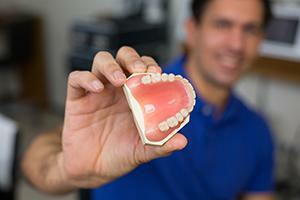 To determine whether you need removable or fixed dentures, our Lindenhurst general dentist will need to make sure that your remaining teeth are strong enough to support the restoration. Of course, as with any restoration, there are pros and cons to consider. The pros of getting dentures are that they can give you new teeth quickly and they are one of the most inexpensive ways to replace missing teeth. We know that some patients are on a budget or just don’t want to undergo invasive procedures in order to get their tooth replacement. If this is the case, then dentures may be the best approach. However, a major con is that a lot of people assume that dentures will function just like real teeth. Even though dental technology has come a long way to providing a restoration that looks similar to real teeth dentures will not function the same way. It will take some getting used to when you first start wearing your new teeth; however, if you get lower dentures you may find that they don’t stay in place as well as upper dentures do. If you are considering lower dentures but hate the idea that your new teeth might shift and move around when chewing, speaking, or biting, then you may want to talk to us about getting dental implants to support your dentures. While the process will take longer and it will be more expensive, implants are designed to last a long time and can support your dentures so they stay firmly in place. Do you have questions about getting dentures in Lindenhurst, IL? Do you want to chat with us about your tooth replacement options? Then schedule a consultation with Dr. Gniadek today.